Whether you want your new home to be factory built and delivered to your site or supplied to you as a ready-to-go kitset, Sunshine can help. A Sunshine transportable home or cabin is built in our factory and then transported whole (or in pieces, for larger models) to your site. For many people this is the fastest, least-hassle and best value option. The Sunshine floor plans can be customised to suit individual styles, requirements and specific sites. You can choose any stage from lined shell (no lining, kitchen/bathroom cabinets) through to a completed, decorated home ready to connect to services. You can upgrade any of the standard fittings. We can provide options for interior and or exterior painting, floor coverings and window treatments. Our standard terms of trade are10% deposit on signing our transportable homes building contract with progress payments based on the stages of work. Building consent and code of compliance are included for complete builds. 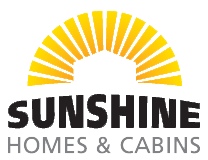 Sunshine Homes offers a 5 year workmanship guarantee in accordance with standard building terms. For anyone with do-it-yourself skills a Sunshine kitset can be a very good way to save thousands of dollars. Sunshine solid timber homes are very easy to build. We can supply an agreed list of materials to your site. You can also buy some materials yourself directly from your local building merchant. Sunshine Homes can be transported virtually anywhere in New Zealand that can be accessed by a house removal truck.